The contemporary Aviva Barstool is sure to please with its pairing of walnut veneered plywood and black faux leather seats. The cushions are comfortably padded with polyurethane foam. A sturdy steel base with gas piston lift is coated with chrome and a plastic ring on the base's bottom helps protect sensitive flooring. 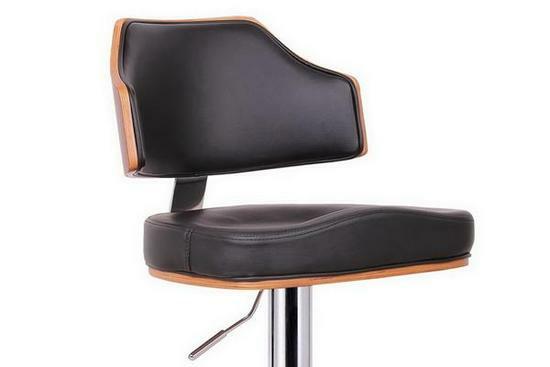 Aviva barstool swivels 360 degrees and features a lever for adjusting the seat's height to suit a variety of tabletops and counters.